Reser Reservoir, a Bureau of Land Management (BLM) reservoir located approximately 18 miles northwest of Chinook, will be slowly drained throughout the summer due to structural damage at the dam. A small washout was observed this spring, and repair and maintenance to the dam is necessary to avoid a complete loss to the structure. Montana Fish, Wildlife and Parks is working with BLM staff to coordinate the drawdown while trying to salvage and transfer as many gamefish as possible. FWP personnel is setting trap nets to collect yellow perch, bluegill, black crappie, and largemouth bass. These fish are then placed into tanks and transferred to other waterbodies. 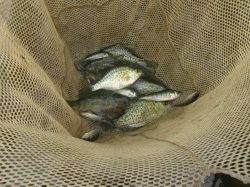 The perch and black crappie will be going to Bailey’s reservoir, the bluegill to Salmo Reservoir, and the largemouth bass to Dry Fork Reservoir. FWP encourages anglers to go to Reser Reservoir and enjoy this opportunity while it lasts. 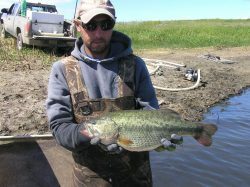 Once repairs are made to the dam and water returns, FWP will stock fish and re-establish this popular fishery. If there are any questions, please contact fisheries biologist Cody Nagel at 265-6177.